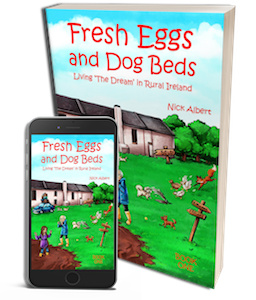 Nick and Lesley Albert yearn to leave the noise, stress and pollution of modern Britain and move to the countryside, where the living is good and there is space for their dogs to run free. Suddenly out of work and soon to be homeless, they set off in search of a new life in Ireland, a country they have never visited. As their adventure begins to unfold, not everything goes according to plan. If finding their dream house is difficult, buying it seems almost impossible. How will they cope with banks that don’t want customers, builders who don’t need work, or the complex issue of where to buy some chickens?